Maintaining an ice road on Canada’s Knipple Glacier is the job of First Nations indigenous tribe company Tsetsaut Ventures. Designed for heavy hauling a severe off-road operations, the Volvo articulated hauler provides continuous production and superb reliability. ‘Community’ is a word that Tsetsaut Nations nomadic tribe descendant, Chief Darlene Simpson considers to be the core of her business. No project has proven too ambitious for the woman who is determined to transform the remote North Western region of British Columbia into a prospering powerhouse, bringing job opportunities to its residents. In many ways, her latest venture – the maintenance of an 11km (6.8mi) ‘ice highway’ that spans across the colossal Knipple Glacier – demonstrates her ambition. The ice highway allows for the transportation of supplies and materials to a remote underground gold mine, located in the Golden Triangle – a moniker given due to the abundance of high-grade gold materials. Pioneering safe and reliable road access and timely transportation of materials is the job of Tsetsaut Ventures, a contracting company, founded by Chief Simpson and husband George Simpson. The year-round job involves the grading and grooming of the access road, as well as filling crevasses. Tsetsaut also provides the mine with machines, peripheral personnel and manages work camps. Since its establishment in 2008, the company has built a solid reputation in British Columbia as a major contractor, working on a number of high profile mining projects and supplying hundreds of jobs for the local community. The company has become the largest employer – of both Aboriginal and non-Aboriginal people – in the region, which has one of the highest unemployment rates in the province. Tsetsaut employs 270 people, 60 percent of whom are Aboriginal. “Our mission is to provide employment and continued services as development increases in the Golden Triangle,” says Chief Simpson. 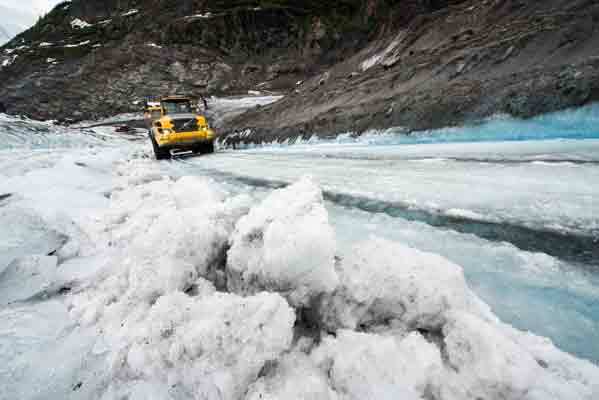 The Volvo excavator is used all year round and in all conditions to preserve the glacier highway and keep the road open. But working on ice is a slippery business. With up to 30m (98.4ft) of snow per year, the glacier is continually moving, freezing and thawing. Unlike soil, ice is at the mercy of Mother Nature, making it far more difficult to work with. As the day warms up, the glacier erodes, causing creeks to form in the center of the access road, which expand into small rivers that must be diverted into drainage ditches. These need daily maintenance and the operator must fill and seal cracks while being careful not to remove too much ice. Operators are modern-day pioneers and must be constantly observant and on the lookout for potential danger. Such are the high demands of the project that Tsetsaut decided to invest in suitably durable machines. The company uses a fleet of Volvo equipment, including three excavators, five wheel loaders and nine articulated haulers. The equipment is used to load and unload freight, haul material over the glacier, load and unload earth for the construction of the mine and remove snow from the access road and mine. These machines have been supplied by respected Volvo CE dealer Great West Equipment of Terrace, British Columbia. “Having reliable equipment that can withstand the weather is crucial,” says Chief Simpson. The modified Volvo A40G articulated hauler is fitted with a deck. 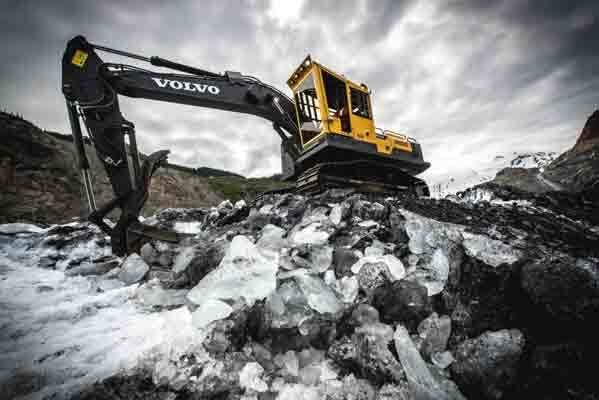 Volvo crawler excavators (EC220E and EC350E) are used year-round and in all conditions to preserve the glacier highway and keep the road open. Equipped with protected components and a robust undercarriage, the excavators are ideal for working in tough terrain and extreme conditions. 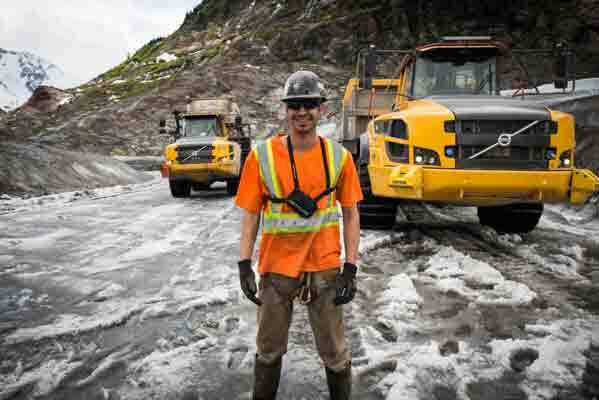 Some of the glacier maintenance falls on the shoulders of Richard Pattison, excavator operator. “Working with glacier ice is a once-in-a-lifetime opportunity,” he says. William Joe (pictured) is one of a team of 10 articulated hauler operators, who use six A30Fs, one A35F and two A40G Full Suspension articulated haulers to make sure the mine is supplied seven days a week. 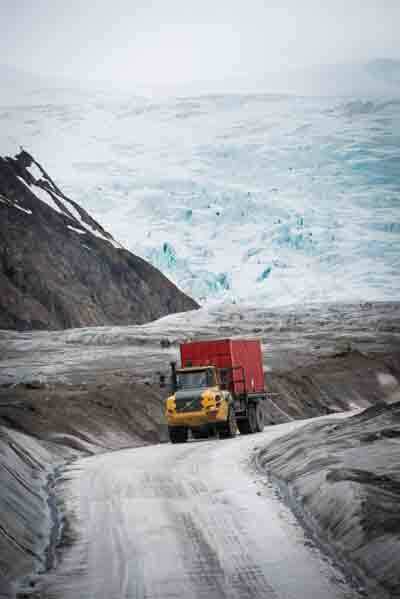 The haulers load up at night and drive in convoy over the glacier to the mine in the morning. They reload at the mine and then make the return trip. The distance across the ice from load to unload is 10km (6.2mi) and a one-way run takes an hour. Operators make an average of three or four trips per working day. William Joe is one of a team of 10 articulated hauler operators at Tsetsaut Ventures working shifts to make sure the mine is supplied seven days a week. Driving an average of 80km (49.7mi) every day, the articulated haulers are designed to keep the operators comfortable and safe – both of which are key strengths of Volvo machines, says Chief Simpson. The industry leading Volvo Cab provides superior levels of comfort, control, ease of operation and safety, helping operators to maintain productivity all day, every day. And with the ability to climb steep gradients, the articulated haulers enable Tsetsaut Ventures to make the otherwise perilous journey safely across the glacier.